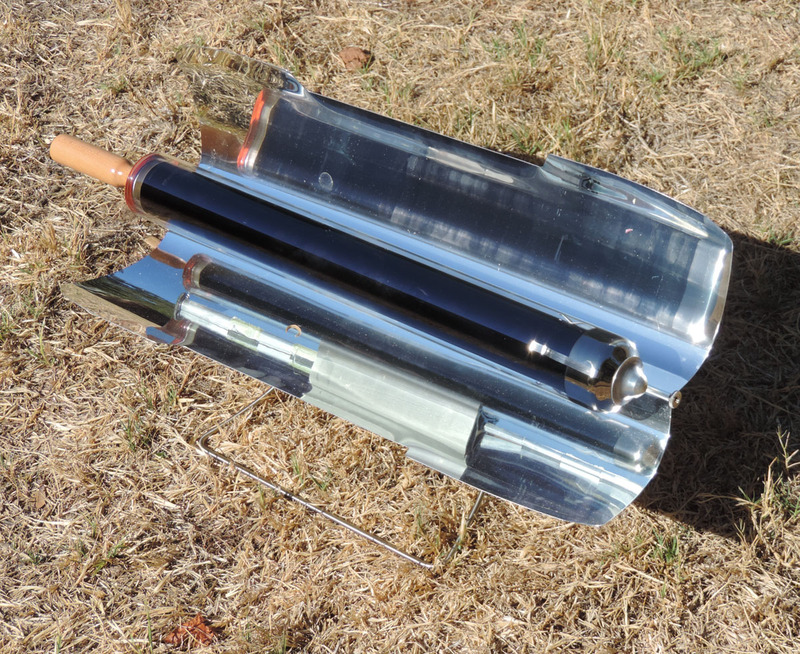 We have been practicing solar cooking for a while now and have a few tips to share with you. I’ve used four different types of solar ovens, and each one has its own characteristics. The four different types are the All American Sun Oven, the Gosun Solar Cooker, the Solavore, and a homemade parabolic reflector. I’d like to give the pros and cons of each oven and then share tips I’ve learned from using this method of cooking over the years. The first one I will talk about is the All American Sun Oven, this is the more traditional box oven and it works very similar to the oven in your kitchen range. If you have good sun and move the box regularly, it will probably take you about twice as long as normal to cook your recipe. This cooker is good for large roasts or casseroles and baking. It can hold large pots and is good for cooking for several people. When making more than one food item, it’s possible to stack the pans/pots, depending on their sizes and configurations. It’s also one of the more expensive ovens, but the company usually offers nice discounts on packages every so often and those packages typically contain pots, pans, and a host of other things to help you get started cooking immediately with the All American Sun Oven. Its main limitations are that you can’t fry anything in it and the price. The Gosun is an interesting cooker. It will cook food quite fast and does a good job, but it will not hold a large amount of food at any one time. However, it’s quite versatile in that it will roast meat, cook vegetables and bake bread. If you are cooking for a couple, this cooker works well. It is fast and easy to use. The Solavore Sport is another effective, commercially sold oven. Like the Sun Oven and the GoSun, it’s also effective, with a simple, basic design. The advantages of the Solavore is that it is very lightweight, less expensive, and is a good deal wider than the Sun Oven. This makes it much easier to cook foods side by side or cook with a large baking pan. While it’s possible in the Sun Oven to use a 9×13 baking dish, I’ve found that it’s rather difficult to get the pan into and then out of the Sun Oven. With the Solavore it’s easier because the oven itself is several inches wider. One small disadvantage of the Solavore is that it’s plastic cover has a very thin membrane that, while made of a strong plastic material, it could still be damaged. Also, the basic Solavore Sport doesn’t come with the metal reflectors. On one hand, this is an advantage, because it cooks food just fine without the reflectors on a sunny day. However, those reflectors become necessary when the sky is a little overcast, so you’ll have to decide whether or not you want to spend the extra money to get them. 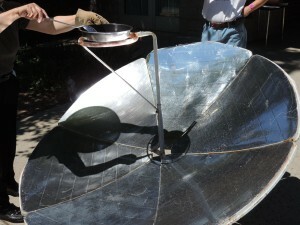 The fourth type of solar oven I’d like to discuss is the parabolic reflector. These are easy to make at home and while the other three ovens I’ve mentioned are like the oven on your stove, these are like the range top. You can fry eggs or other foods on them and cook anything you normally would on your range top. However, they are not good for baking or other foods that you would normally cook in your oven. Now, with each of methods of solar cooking, you will have successes and failures. One of the most interesting was the ramp cake. Let’s just say that with the All American Sun Oven you have to be sure to level the cooker even when you’re moving it to catch the sun. I assembled the two layers and frosted them and it was delicious. Solar cooking works great and is a good addition to your preps, but you need to take the time to use it. There is a bit of a learning curve. Now on to a few very helpful tips. Be sure to use dark pans that are made of thin metal. Although you can use cast iron, the thicker metal takes longer to heat up and will prolong your overall cooking time. Keep a notebook of everything you cook in a solar oven. They do NOT cook like the oven in your kitchen but because of so many different variables, it’s hard to say what the exact best baking time will be for you and whatever it is you’re cooking. Write down the food, the weather, even the pan you used, and then the amount of time it took to fully cook. Learn the difference between the “slow cooker” method and the faster “eye on the sky” method. The slow cooker method is simply placing your solar oven and food out in the sun and leaving it there all day. However, if you want your food done more quickly, you’ll have to keep an eye on the sky (watch for clouds) and move your solar oven just a bit so that it remains in full sunlight. If you have more than one type of solar oven, make a pan of brownies or store-bought corn bread mix to test it. The ingredients and pan size and type will be consistent, helping you to know how each oven bakes differently. Never use anything shiny and reflective in your solar oven, including aluminum foil. Get a WAPI, Water Pasteurization Indicator, so you can use your solar oven to pasteurize water. This device is also helpful in learning how long it takes a particular solar oven to heat up. 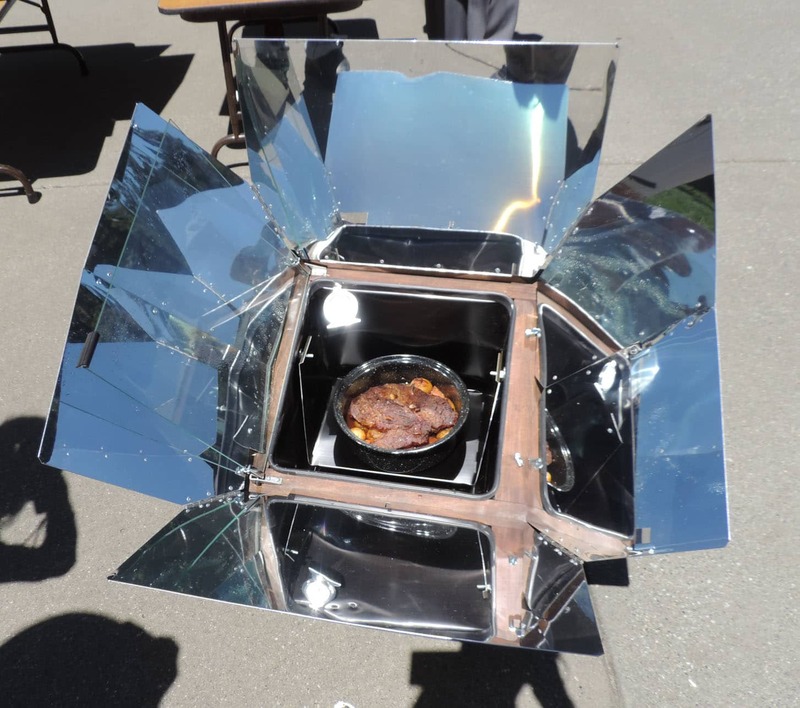 A solar oven with a tightly fitted lid, like the Sun Oven, can help you avoid cooking odors in a post-TEOTWAWKI world. 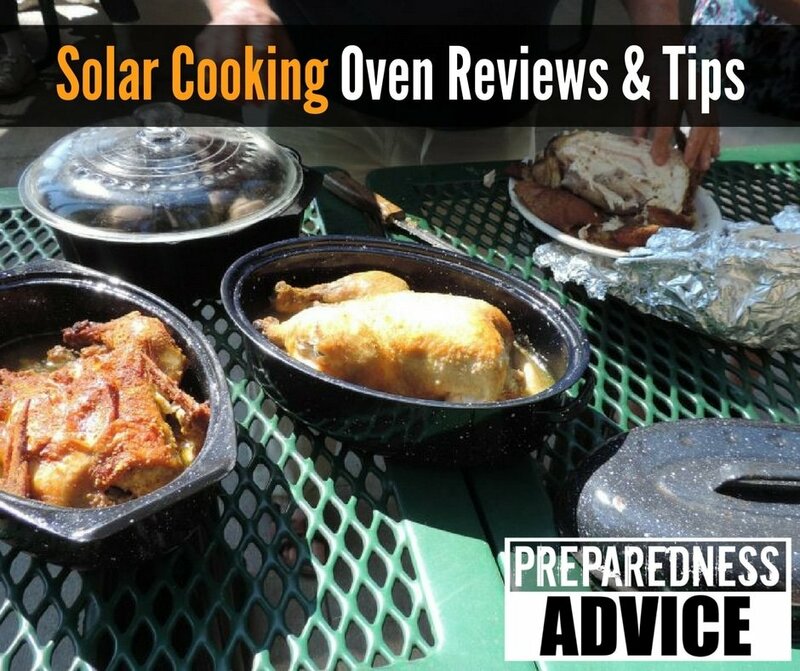 Once you get started using solar ovens, you’ll have plenty of additional tips to add. The beauty of using the sun for cooking and heating water is that it’s a completely free fuel and you don’t have to worry about safety issues with storing “solar” as you would with storing other fuels. This entry was posted in solar and tagged solar cooking, solavore, sun oven, WAPI. Bookmark the permalink. 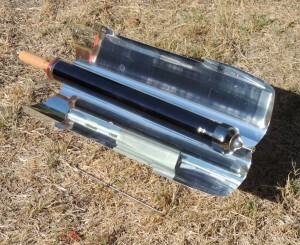 Do you have any articles on how to build your own solar oven using healthy materials? (I noted one made with an old tire, but petroleum products aren’t healthy). Thank you. Start by identifying what you do NOT want to use in a solar oven. Is aluminum foil on the list? If so, you’ll need to find another highly reflective material to use, possibly heavy duty mylar? You might also take a look at using a Fresnel lens to focus sunlight on a cooking pot or a parabolic solar cooker. Of the two, I’d have to say that the All American is my favorite. It’s very heavy duty and I like the fact that the reflectors are attached to the oven. We own two Sun Ovens and they are very sturdy and reliable.